With anticipation for his forthcoming album on Tri Angle still building, Bristol-based producer Vessel drops a second EP on UK imprint left_blank. Released on left_blank last summer, the producer's Nylon Sunset EP was one of 2011?s most original sets of dance tracks not necessarily aimed at the dancefloor, connecting the dots between Bristol's house, techno and dubstep scenes with an imaginative flair some of his more hyped peers in the city struggle to achieve. 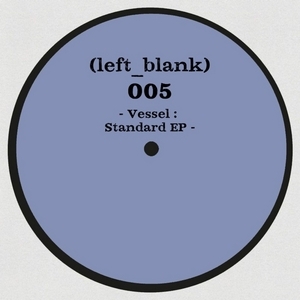 His second EP for left_blank, entitled Standard, follows a split cassette release with El Kid on Astro:Dynamics and a digital release for A Future Without, and sees him continue to develop his unique brand of house and techno, with the title track experimenting with the kind of narcoleptic sounds Andy Stott and Claro Intelecto have adopted on recent releases. "Merge" meanwhile comes across like a smudgy take on classic Detroit techno, whilst closer "Zero" sees his talent for abstract rhythmic structures come to the fore.